I feel as if I’m being held captive within the walls of my own home, but in all actuality, my captivity stems from the walls of my own heart. Today, once again, the house is quiet: everyone is back at work and school and I am home alone. The only noise I hear is the sound of raindrops lightly beating on the rooftop. Mondays always make me feel a little detached from the world, but with the much needed rain falling today, that feeling is magnified a bit more. I feel as if I’m being held captive within the walls of my own home, but in all actuality, my captivity stems from the walls of my own heart. Today, in the quietness, I have no choice but to recognize this reality. The issues I can pinpoint, even try to justify, yet I know the loneliness I feel is the result of separation from my Father. So often I’ve been known to call on others instead of first communing with my Father. As it so happens, our home phone has been having problems for quite a while now and seems to worsen with any sort of moisture, so with the constant rain, a conversation with anyone today is not a viable option. One thing I have learned is when it comes to matters of the heart, there is nothing anyone can say or do to change it’s condition except my Father. Jeremiah 29:12-14 KJV 12) Then shall ye call upon me, and ye shall go and pray unto me, and I will hearken unto you. 13) And ye shall seek me, and find me, when ye shall search for me with all your heart. 14) And I will be found of you, saith the LORD: and I will turn away your captivity, and I will gather you from all the nations, and from all the places whither I have driven you, saith the LORD; and I will bring you again into the place whence I caused you to be carried away captive. On a day like today, He leaves me no choice but to commune with Him, and for that I am grateful. Now, please excuse me as I prepare for freedom once again. This week I’ve worked a lot more than usual, therefore I’m more tired than usual. The mountain of laundry, sink full of dishes, dining room table serving as a catchall completely overflowing, things strewn about everywhere and even cobwebs here and there are a reminder of the busy week I’ve had. I usually keep Mondays open for me to clean up the week’s mess here at home but this Monday I worked. On the way to the shower this morning, in preparation for the day’s work outside the home, I decided to message the client and make sure we were on for today. Before I walked into the bathroom I noticed the messy house and just how uncomfortable I was in my own home. I thought about my family and how they may feel about the lack of a home cooked meal as the days of the week have passed. I’ve done less and less with each passing day. Although I am grateful for all the work rolling in, I was a bit overwhelmed. I’m sorry to say, but this is the way I felt this morning when I was waiting for the reply as to whether I’d be working today or not. After I got out of the shower, the reply was I wasn’t needed today. I have been so exhausted I nearly cried. I took it as a much needed break and praised God for the day off to get my own house in order. 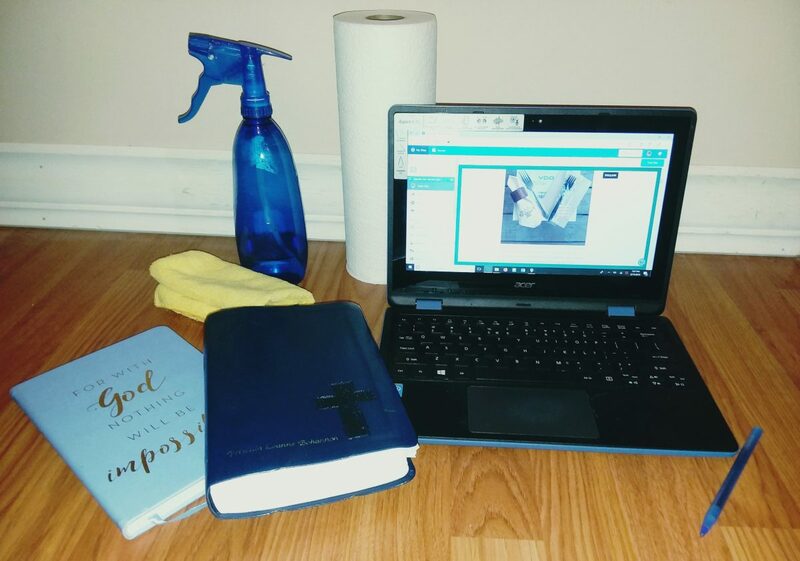 A few weeks ago my friend, Elizabeth, and I were talking about needing to clean our own house (spiritually speaking) before we tried to clean someone else’s. Many times we’ve talked about needing the Lord to cleanse our hearts. The dirt, cobwebs and dirty laundry can pile up in a split second. So today, as I am picking up what all has piled up in my own house, I am reminded I need to work on cleaning my own mess before I try to clean someone else’s. Psalm 51:9-10 KJV 9) Hide thy face from my sins, and blot out all mine iniquities. 10) Create in me a clean heart, O God; and renew a right spirit within me. So it is better to not be so preoccupied with cleaning up for others that I neglect cleaning my own “house” spiritually and physically.